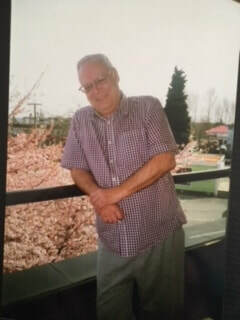 Jim passed away peacefully early Tuesday morning, March 21, 2018 at McKenney Creek Hospice in Maple Ridge B.C. We have lost a true Meccanoman and a friend. Jim a few years ago on his balcony where he spent many hours stripping and painting Meccano. Jim in "Hotel Maple Ridge", which was his name for the hospital. He liked the food there and staff there. I've known Jim for 40 years, We talked just about every day operating bulletin boards (BBS) for many many years He was one my best friends, I can't believe he's gone. It took me this long to say anything. God bless you. Jim was a good friend and skilled meccano modeller. He particularly liked building construction equipment - especially bulldozers. Jim and I spent many hours on the phone discussing the models we were building and he gave me many useful tips and just a little friendly banter about why it was taking me so long to complete a model! As two bachelors we often discussed what to make for supper and where the best food specials were. I will truly miss you Jim. I always admired how quickly Jim made up his mind and then acted on it. He had enough experience and smarts to do it well. He was always looking for something new to try. 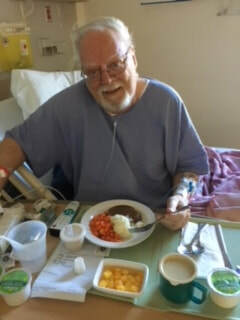 Jim kept his sense of humour when he was in the hospital for the last time. Even with laboured breathing he could find a way for us to have a laugh at my expense. I will miss him. I had never met Jim in person but had traded and emailed over the years quite a number of times. His enthusiasm for Meccano and the fraternity of like minded knowledge seekers always shone through. Our last communications were of him getting into Arduino control which is only a small example I am sure of Jim's desire to always be learning new things and generally enjoying his hobby. Rest in Peace dear fellow. Since I rediscovered Meccano and found the BC Meccano Modellers group a few years ago, I got to know Jim quite well. He was extremely knowledgeable, entertaining, and generous. Despite longstanding health trouble and the frustrating erosion of Meccano enthusiasm, he brought enthusiasm and discipline to our group and keep the flame alive. He was a tireless advocate for Meccano and a friend that will be sadly missed at every one of our meetings. When we contacted the BCCM from Australia we spoke to Jim, who immediately us made feel welcome. When we finally arrived, Jim let us stay at his place while he stayed with another tenant, a nice lady, unfortunately i have forgotten her name. I had the good fortune to model with Jim over about 2 days. We sat down at his table and I made the Gyroscopic walking man for the next meeting Jim had postponed, so I could attend. Meccano modelling with Jim was an experience I will never forget. It was great , every time I needed piece, up Jim would get, it felt like being treated as royalty, he could have had a job at my place. While modelling, or Jim getting up to get pieces, I taught Jim the Australian sense of humour, called 'taking the piss'...."kind" insults :-). Jim rose to the challenge, he would have made a good Aussie. Jim enthusiasm for Meccano knew no bounds, and no place was out of bounds for Meccano in his apartment. Jim is up there with our ex-president Malcolm Booker. It is a great pity Jim never came to Australia, and we were hoping we could visit him again in about 4 years when we plan to return to BC, in fact he was one of the main attractions to going back. Winnie and I have very fond memories of Jim, and to us, he will always be living in Vancouver (well just outside it)..I could find my way there now :-). To all his family and friends, he was a fantastic man, the world was richer for having him it and poorer now he is gone, but we will remember him fondly until we join him, hopefully to make some great Meccano models, Frank Hornby will enjoy our company. Please convey our condolences from Meccano Modellers Association Sydney. Although not many of our members would have met Jim we know we have lost a true Meccanoman. Sorry to hear this, and please pass our condolences to Jim's family and friends. He was an active model builder, parts buyer and seller, and well known in Canada's Meccano community. A few years ago he kindly traded me a rare "Royal Meccano" instruction booklet (from 1911-1912) in return for parts, and it is one of my paper treasures. RIP Jim, you will be missed. So sad to hear of Jim's passing, he introduced me to the group and was a real pleasant soul and gentleman! When my childhood interest in Meccano revived a couple of years ago he got me up to speed on this group and the general 'state of the union' with respect to the world of Meccano. I will be adding to this memorial so please send us any messages or pictures.